Like a great many in Riverwalk Quilt Guild, Wanda Jones has always sewn. Even before she started high school, she had a clear idea of what she wanted to wear and began making her own clothes. Growing up in Hinsdale where she attended high school, she went on to attend Augustana College where she met her husband and majored in speech therapy. As their life together unfolded, the couple found themselves coming to Naperville in 1969, where she did administrative work for District #203 and ended up staying at the job for thirty years. In 2001 when she was considering retirement, she was taking quilting classes with some fellow workers. Also, her church had started a quilt group, in which she continues to be very active. 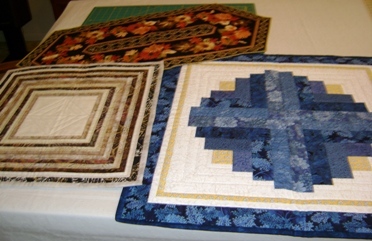 By the time she retired in 2002, she was exploring quilting from many different angles. That’s when Lois Skoogland and Darlene Schille encouraged her to become a member of RQG. She has since served on the board as hospitality co-chair with Darlene. Quilts are everywhere in her house, adding whimsy and style wherever you look. She particularly likes using oriental fabrics. Most often she sends her work out to be quilted by someone with a long-arm, but she does her own "in the ditch" or straight line quilting on smaller projects. She made an exquisite king-size that serves as a bed-cover and displays a tiny quilt she made just because she liked the pattern. Wanda is always looking for new inspiration and goes to shows and meetings of quilters wherever they may be. Her favorite place to sew is on her dining room table where she keeps one machine when dinner guests are not expected. Her stash is everywhere - under beds, in closets, even in the crawl space, she adds with a maybe-yes, maybe-no kind of grin. Always appreciative of the work of other quilters such as Bonnie K. Hunter (www.quiltville.com) , she is now making a quilt that includes the addition of wool pieces and supposes she needs to talk to wool-expert member Dorothy Larsen about how to do it.